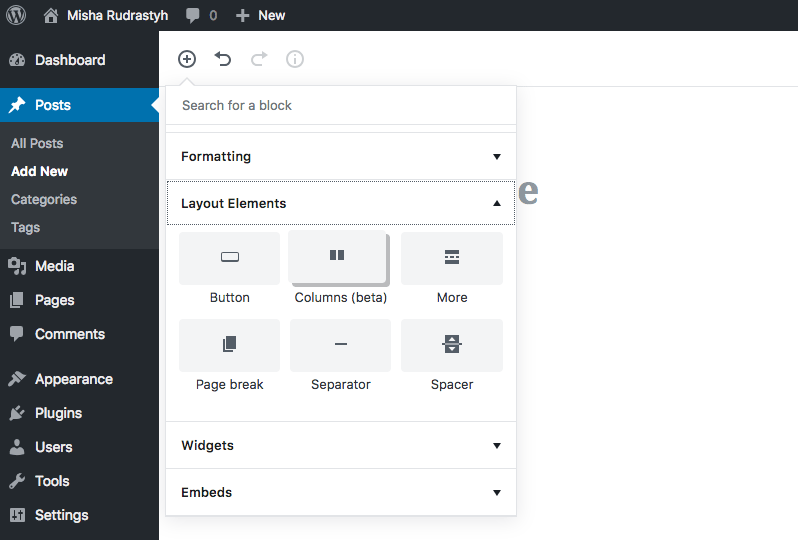 In this tutorial I will show you a super-simple way to remove any of the default Gutenberg blocks from the inserter. Once I installed Gutenberg I faced with some issues. White screen on the page/post edit pages, which was resolved just by switching the theme to default and back again. Console errors, all of them has been fixed when I removed this code from the functions.php which disables the REST API. And the next thing I faced with is the large amount of blocks, which is cool of course, but I’m such a minimalist. How to Remove Certain Default Blocks from the Inserter? In fact, I didn’t find a way to remove specific blocks from the inserter with the help of hooks (so, we can use them in the current theme functions.php file or in a custom plugin). But there is an awesome hook allowed_block_types that allows to specify blocks we would like to use on our website and besides it accepts $post parameter, so we can use different blocks for different post types and that’s awesome! If you tried to print_r( $allowed_blocks ), it returns nothing. Why? Because by default the allowed blocks array is empty, which means to display all blocks. If we add something to this array, only the blocks from the array will be displayed. If allowed_block_types filter hook is used several times on your website, you could get or print the allowed blocks array which was specified earlier in the same hook. Maybe you’re wondering where to get block IDs (slugs) to pass into the array. The full list is below. What is $post? Post object indeed! So, you can even allow or disallow specific blocks by the post ID! To make it more clear, I split the list by categories and added some screenshots. Oh my gosh, so much blocks are here. Good to know we can disable or “enable” them as needed :) I was already a bit scared when thinking about the next WordPress themes to build for customers having all the core blocks by default and thought about how to get all that block elements styled fitting to the rest of the theme. Thanks for posting this tutorial – it’s very helpful! perfect. Thank you indeed. Very useful! While it is playing “catchup” to other website builders and applications out there, it’s still way better. Will this deregister all blocks from plugins as well? Hey this is very useful and something I was looking for to build the next custom themes. Thanks so much! How do you include a custom block in the $allowed_blocks array? Do you know what code will correctly include the custom block in the array so it is still included in the editor? So, in the above example it will be misha/custom-testimonial. Just pass it into the $allowed_blocks array as well. In case you want to filter out just some of them (blacklist vs whitelist). Just a headup: `core/text-columns` seems to have been renamed to `core/columns`. Also, using this filter seems to prevent any reusable block to be used. Has anyone find a solution? Ok, got it, had to add `’core/block’` to the allowed block list. So you can just remove one block at a time, if that’s you’d rather than enable. That looks promising but one question, does this involve creating a plugin? I’m a new developer to wordpress and have not created a plugin yet. Modifying the functions.php file is more familiar for me. Would I have to learn how to create a plugin first before implementing this solution? Also – thanks for the great tutorial Misha! I couldn’t get blacklist and whitelist to work so this helped. I also couldn’t find official documentation for the core slugs. Do you know if there’s an official list in the Gutenberg Handbook on wordpress.org? For those that are using the `acf_register_block` method, you will need to use the prefix of `acf/your_custom_block_name_here`. Also, found another quirk, if you use `’name’ => ‘your_custom_block_name_here’` when registering, you will need to replace underscores as hyphens. Thanks a bunch for this tutorial! I also noticed that if you’re inside the paragraph block and you click on the add block icon it shows an “Inline Elements” tab with “Inline Image” block inside of it. How would you remove that? ‘core/media-text’ is missing from Layout Elements here. This is so strange to have to define ALL that you want when you want to exclude certain blocks. But if you want to allow just 4 blocks, it is ok, isn’t it? I follow your tutorial and was able to successfully remove the default Gutenberg blocks. I am creating new blocks using ACF and am trying to add reusable blocks back to the editor. And ideas on how to do this? Thanks! ACF seems a good plugin but I do not like it and never use it on my projects. Sorry I think I said that wrong. Yes I am using ACF to create new blocks, BUT I do not think the issue is because of ACF. When I follow your tutorial and limit blocks based on post type I lose the option to make them reusable blocks. My question is do you know how to add that option back after limiting what blocks can be used by custom post types? …but reusable blocks remain disabled – any ideas Misha? Currently no. But I will post any updates here. The following worked for me. I use “hero” as an example block name, but you can of course use your own. Well, I was looking for a way to remove a certain block from the editing page (I’m new to Gutenberg), and this post is definitely not what I was looking for. Oh well, moving on. This was very helpful, thanks! As a non-developer type who doesn’t want to dig too far into the code is there any chance you (or someone else) might build a helpful plugin that allows you to “hide” all the block types you don’t want users to see? The amount of choices is really overwhelming when I am teaching clients how to use Gutenberg editor. I really only want to give them like 5-8 block choices. Using `core/cover-image` doesn’t display the cover image block, has it been renamed? Yes, it has been changed to core/cover. Great article! Add core/block for reusable blocks. Text columns is now called core/columns. This is true! Thank you!